Summer is here! And as temperatures rise, many people will start to look for something new and cool to wear. Some take advantage of the good weather to go to the stores, admire the latest trends and pick up one or two new favorite pieces. However, ever more people are now shopping online as well, buying blouses, shirts or sandals at the click of a mouse. 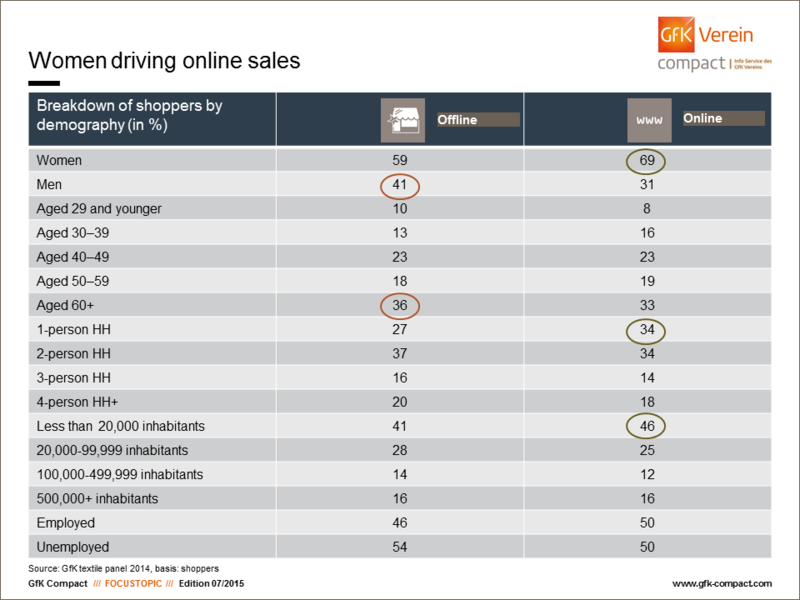 Women especially, of all ages, are driving online sales upwards. The opportunities afforded by the internet are now an integral part of our everyday lives: internet banking, downloading books and music as well as often booking vacations online too. It is little wonder then that online shopping for clothes is also becoming increasingly popular. 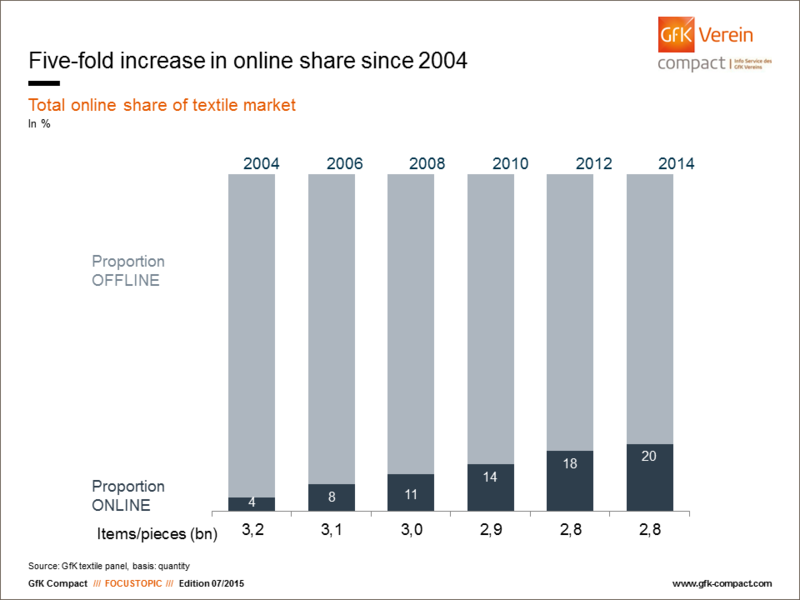 For a number of years now, retailers and manufacturers of clothing, shoes and other textiles have seen consumer interest in their online offerings increase: in Germany, one in five textile items is already purchased online. 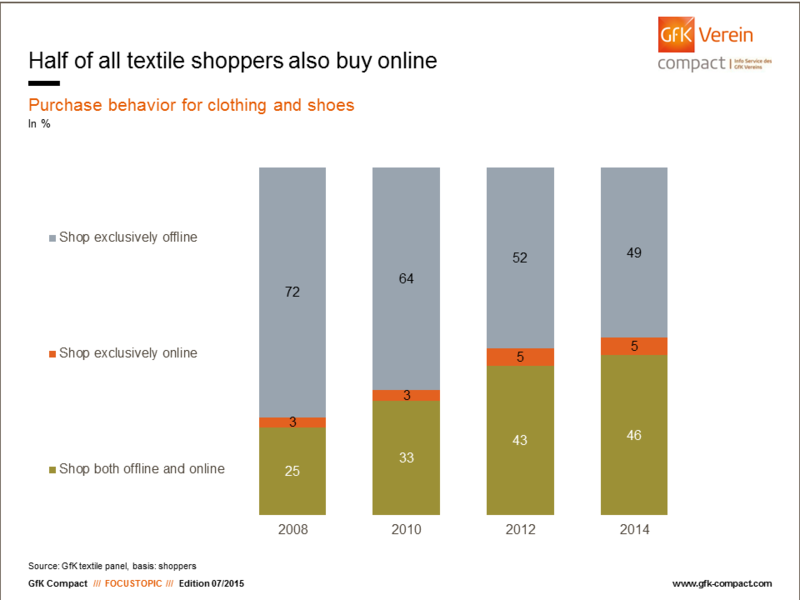 This is shown by the latest figures from the GfK textile panel, comprising nearly 17,000 participants, who report continually on their clothing and shoe purchases. The ability to shop regardless of store opening hours, to browse through merchandise in peace and quiet, along with free returns if the shirt or pants do not look quite as good as they did on the computer at home: it is perhaps this flexibility in particular that is making buying clothes and shoes online more and more attractive. A total of 5% of consumers already purchase their textiles exclusively on the internet. Although these consumers still represent the smallest group, they have been catching up in recent years. The internet offers compelling advantages for fans of brand apparel especially, with the average online price for branded products in 2014 being 6% below that offered in physical stores. It is therefore hardly surprising that more than one third of all textiles sold online carry a brand label. Also benefiting from the bargains available on the internet is the fastest-growing group of shoppers. 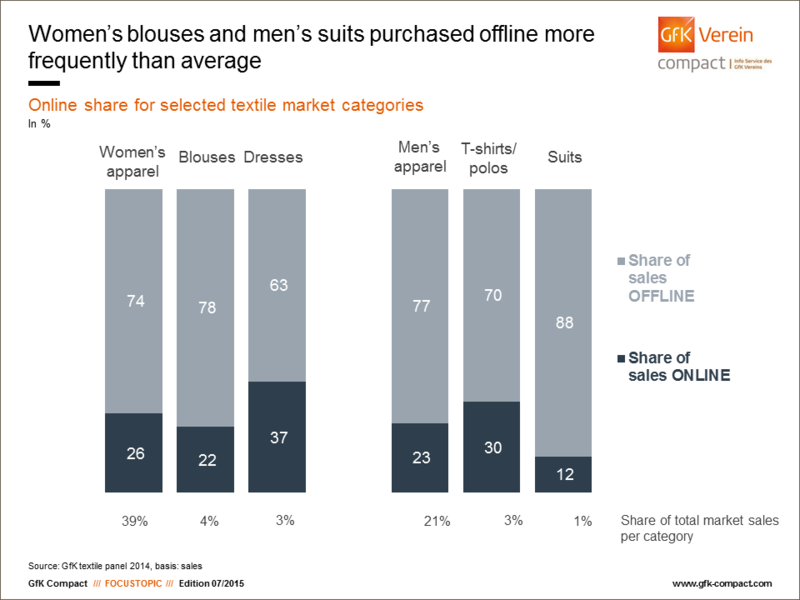 These are consumers who buy clothes both online and offline. In 2008, only one in four consumers used both options to fill gaps in their closets and shoe racks, whereas today 46% of respondents shop online and offline. This means that they can compare prices directly. While the size of this group has increased, the number of shoppers that do not buy from the internet, preferring instead to stroll around boutiques, department stores or other outlets has dwindled. Less than one in two of respondents is still a pure "offline shopper", buying pants, jackets and the like exclusively in bricks and mortar outlets. In 2008, this group still accounted for the clear majority of Germans at 72%. According to a current gender cliché, men tend to be more interested in technology, while women lead the way in fashion shopping in general, and online fashion shopping in particular. An analysis of buyer structures reveals that more than two thirds of online shoppers are women. Whether or not this is down to the fact that in its advertising campaign "Zalando", one of the biggest internet fashion retailers, initially only featured women screaming with delight, it is clear that women of all ages shop online. 46% of those surveyed using their computers to buy fashion items live in towns and communities of less than 20,000 inhabitants, while for bigger towns, the number drops to 25% or less. This might be because such towns offer a more comprehensive choice of boutiques and other stores, so people are less reliant on the internet. Whatever the case may be, offline customers tend to be male and older, with 41% of customers who buy clothing in-store being male. Conversely, men constitute less than one third (31%) of all online fashion consumers. Consequently, more sales are generated online with women's apparel than with suits, ties and other items of clothing for men. In ladies fashion, online sales account for 26%, while for men's fashion the figure stands at 23%. However, there are also differences when it comes to the various clothing items. Women are particularly happy to buy dresses online, and these represent 37% of online sales. Conversely, a mere 22% is attributable to blouses. These are more frequently purchased offline. This is perhaps because blouses are part of the classic business outfit and a perfect fit is particularly important for the workplace. Men also like to try items on in store and seek advice when purchasing business classics. This especially applies to suits, for which 88% of sales are generated offline. Quite probably, it is also very difficult to choose an entire suit outfit online and ensure that pants, jacket, and possibly also a waistcoat, really do fit well. However, technology is making great progress here, for instance with the introduction of body scanners. And new technology can do even more: there are smartphone apps which allow us to maintain an overview of all our clothes, help us pick out a winning outfit every day and ensure that no pieces lay forgotten in the back of our closets. Online shops such as Zalando offer apps with picture recognition. If you see a person wearing something great and upload a photo, the app will show the corresponding or similar item from the online catalogue. Then you can just click to add the pants, shirt or sandals to your shopping cart. Customer wishes are turned into reality even quicker, and such features mean the textile industry is setting new trends not just in fashion but in technology as well. Together with 17 trend scouts, GfK Fashion & Lifestyle has devised visionary fashion trends and shop concepts for the future of in-store fashion retail. The shop concepts and approaches regarding consumer behavior were then evaluated by consumers in workshops and quantified in the GfK Textile Panel in a survey comprising 16,800 participants. The findings show eight clearly distinct consumer groups who are currently determining the fashion market in Germany. The accuracy of the description of these groups means that relevant results for individual, forward-looking shop concepts for German fashion retailers can be defined. Members of GfK Verein will receive a membership newsletter concerning the study within the next few weeks.